I am constantly looking for new, fun projects for my students. Several of them had noticed a pretty pillow in one of the knitting books that I have available for them as reference and they wanted me to make one for them to see. Of course I obliged! 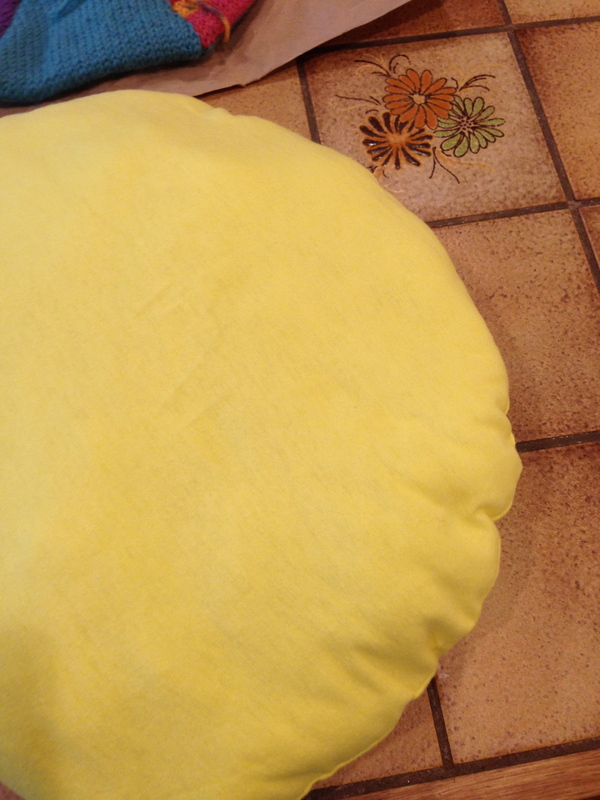 This pillow was so easy and fun to make. I love the flowers – they make me happy and make me think of spring. 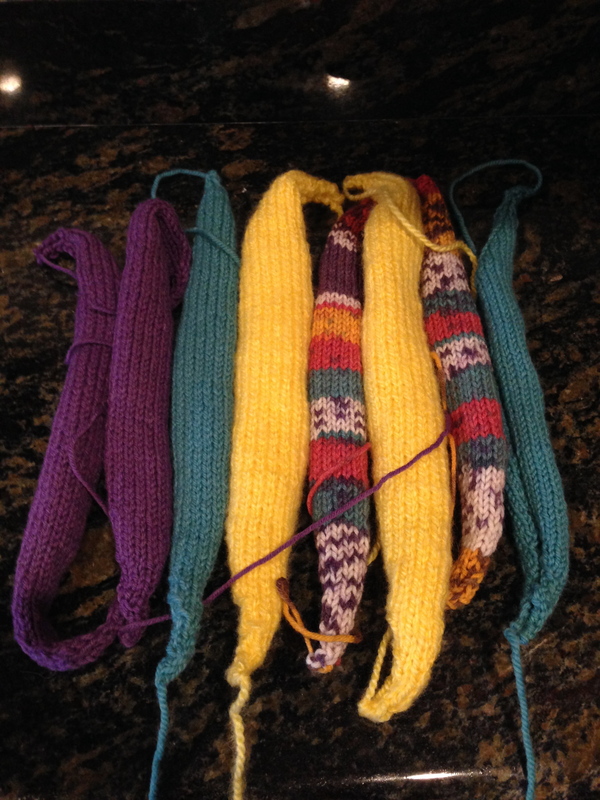 I started knitting as directed by the pattern, but soon realized that there would be an incredible amount of sewing at the end if I continued. 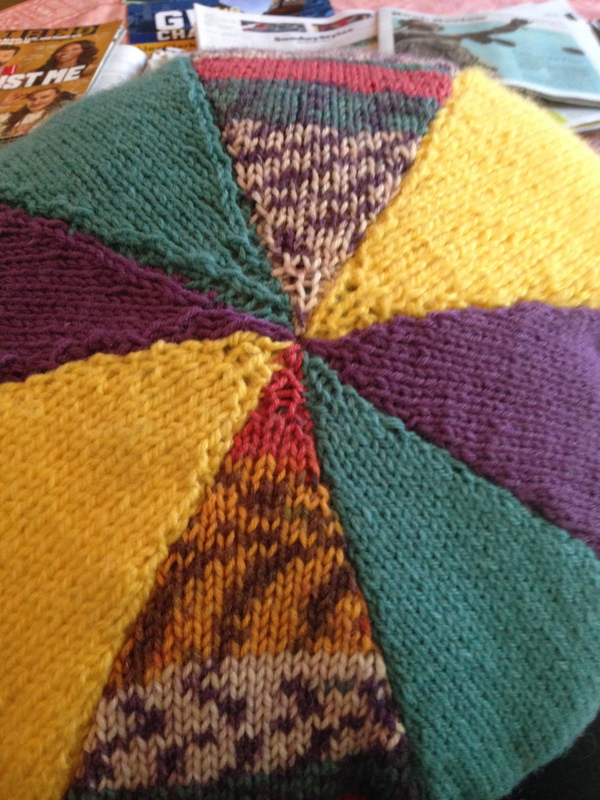 The pattern tells you to knit triangles, sew the triangles into wedges, then sew the wedges together. 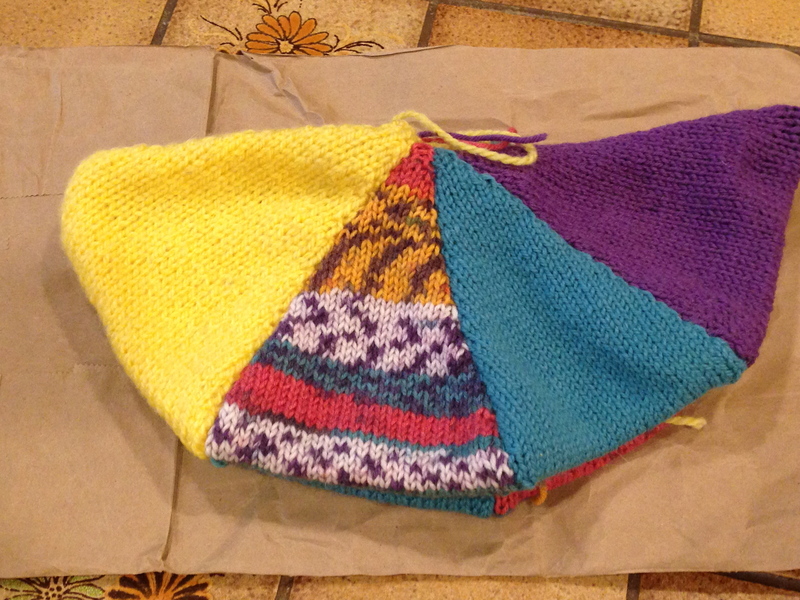 I decided to rewrite the pattern so that each wedge would be knit complete. All my wedges. Look how rolled up they are!! 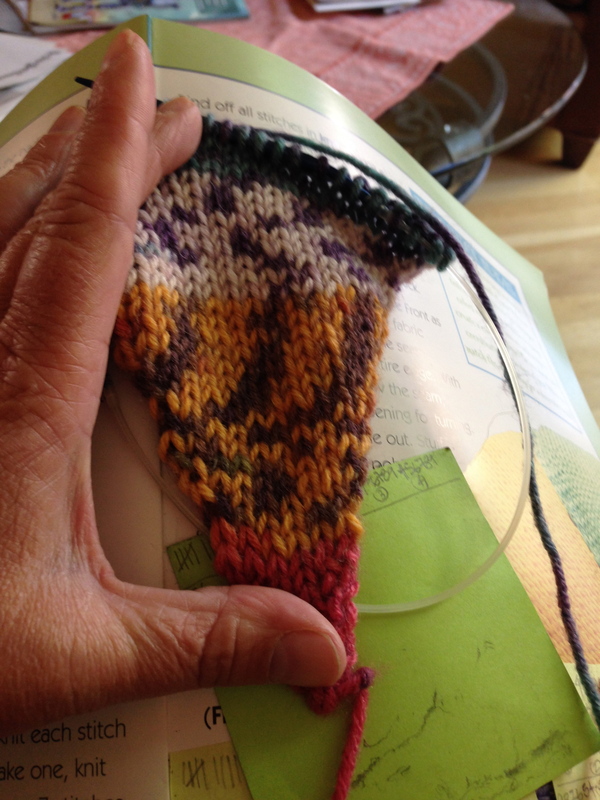 That’s what happens when you knit totally in stockinette without a border. After all the wedges were complete, they were sewn together. 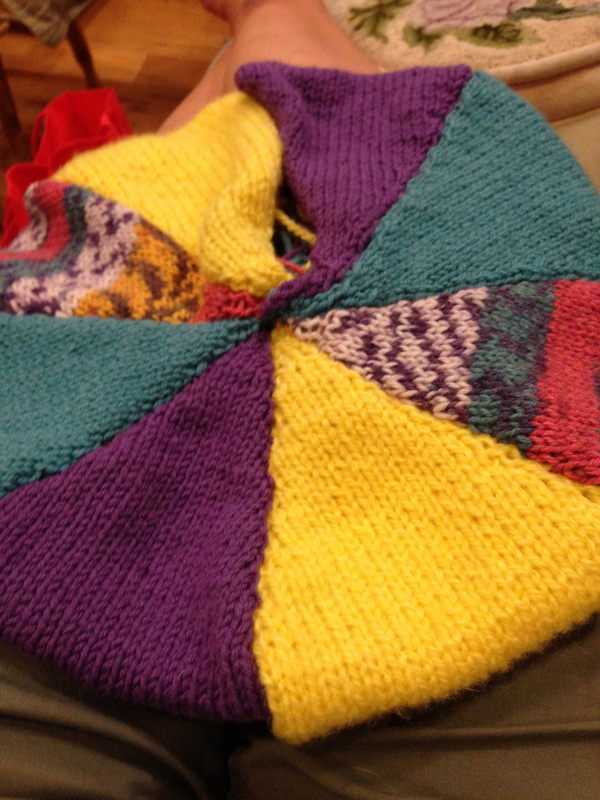 Still a lot of sewing, but not a daunting amount. The pillow was now ready to stuff; however, if we were to just stuff it as is, we would wind up with a ball instead of a disc. A pillow form needed to be made. 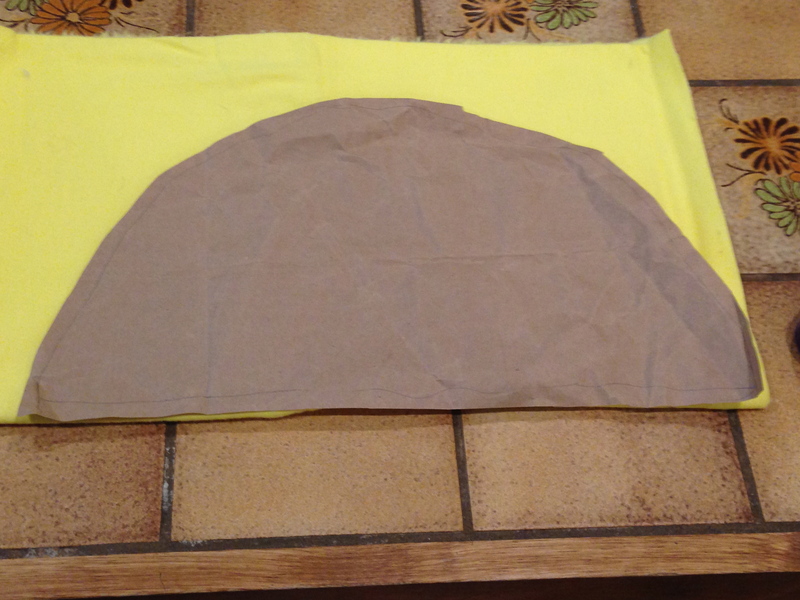 I folded the pillow in half and traced around it to make a pattern for the pillow form. Then used the pattern and cut some fabric. 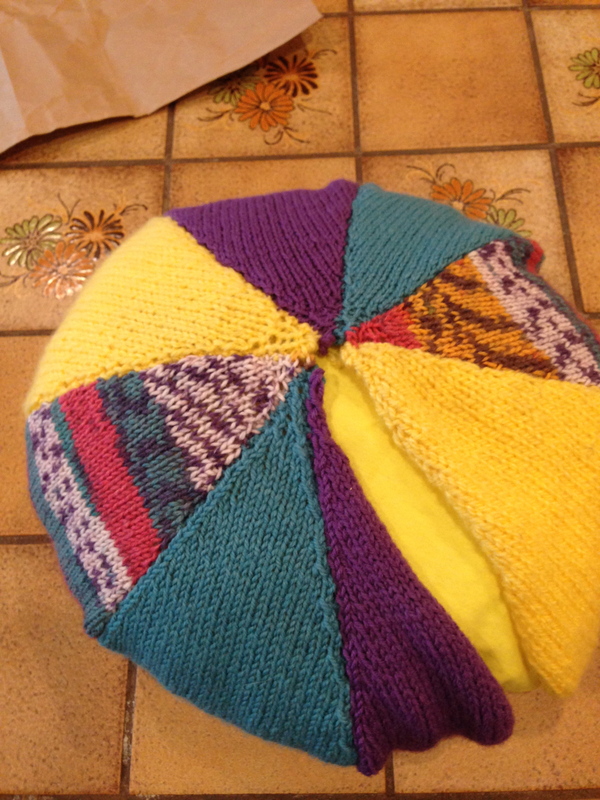 After cutting, sewing and stuffing, my pillow form was complete and now it was time to place it into the knit shell. 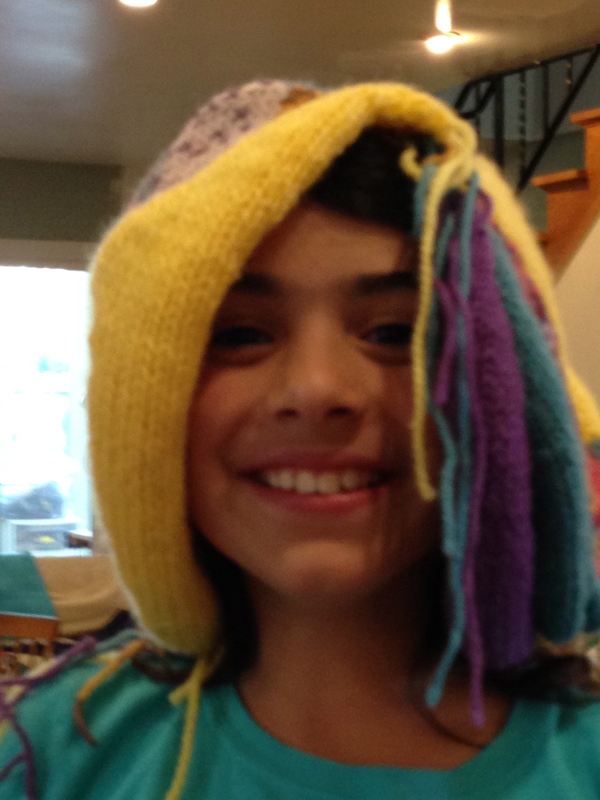 But first…some fun was to be had with the knitted piece I suppose it looks just as nice (or nicer) as a hat!! 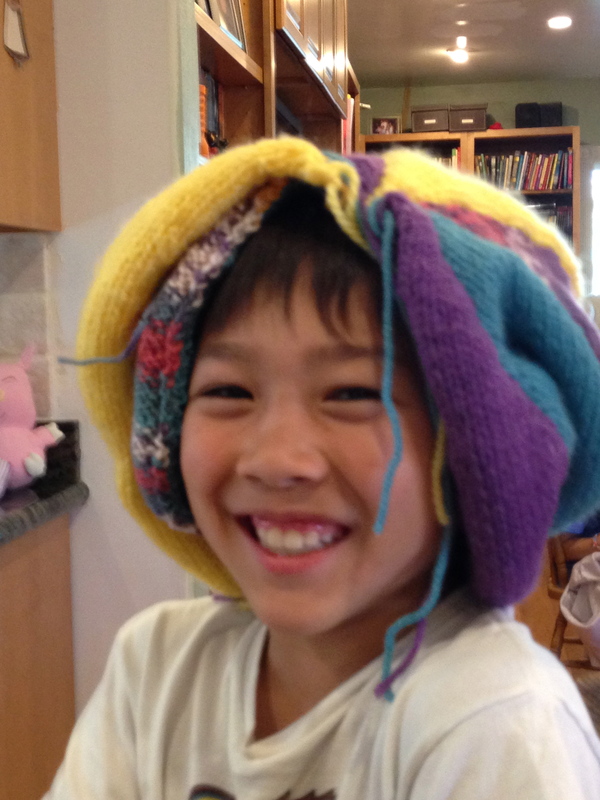 I finally was able to retrieve my hat/pillow and continue on :o) The pillow form fit perfectly! 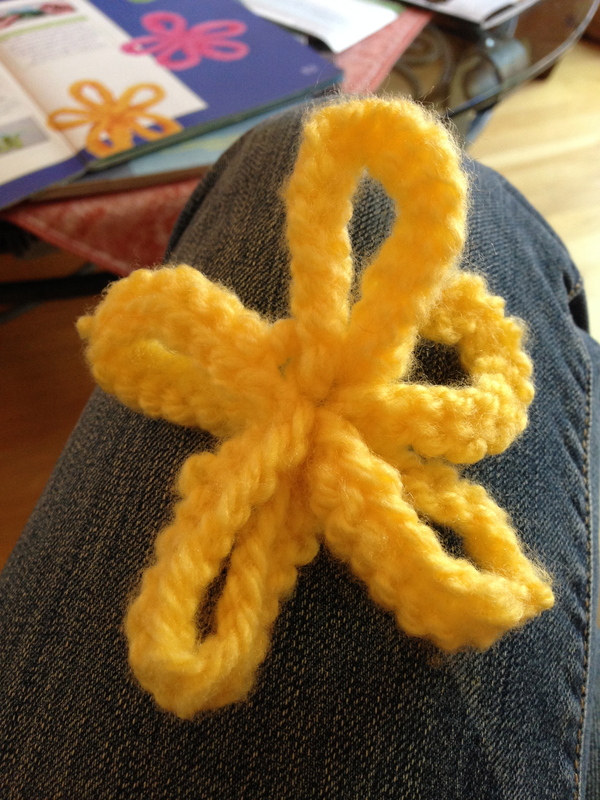 The last wedge was sewn up… First flower made… I loved the flowers, but thought they needed a little more pizzazz. 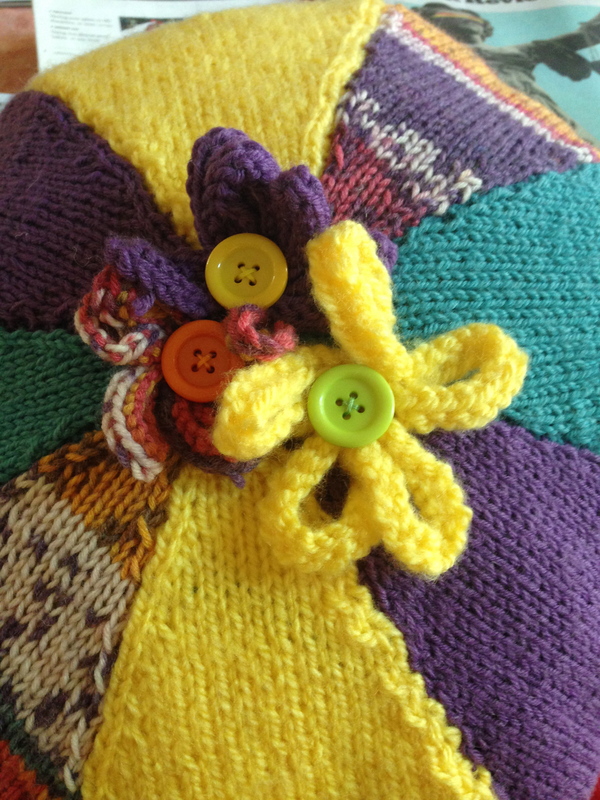 Bright buttons were the perfect addition! 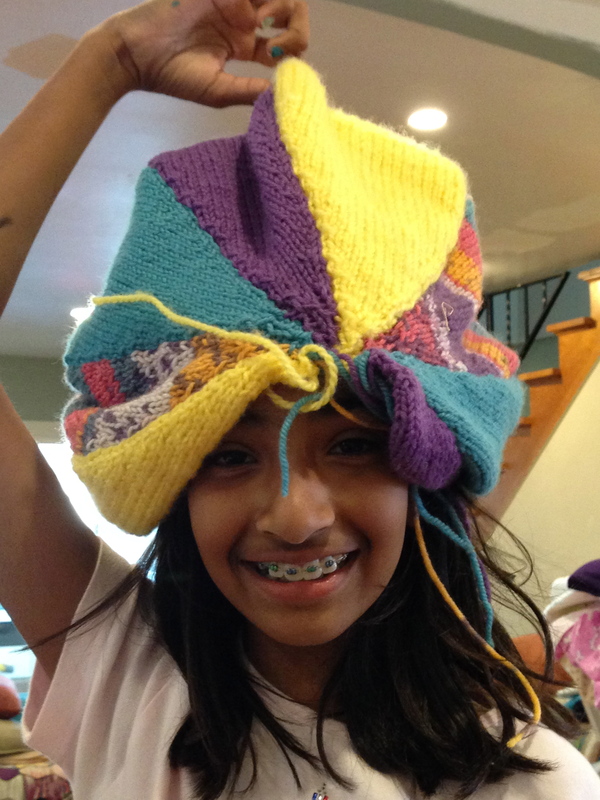 To see more of what my students have been up to lately, check out the new blog post on Let’s Go Crafting!